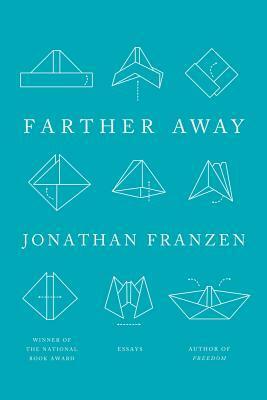 Franzen, J. (2012). Farther Away. Farrar, Straus and Giroux. Farrar, Straus and Giroux, 2012. 321 pages. can a better kind of fiction save the world? a bit about his marriage, and how he fell in love with birds, and how putting yourself in potential danger is the only way to live and love? about his house-sitting history: in one, he got cucked by the son of a friend who said "This is my house, Jonathan"; delayed mowing the lawn until hornets started nesting and he almost blew himself up trying to get rid of them. now he lives within his means. a positive review of weird book about 100 brothers who live together. unreliable narrator. very weird. who are your influences: dumb cus only young writers have direct influences; once you get older they kind of meld together. mentions Harold Bloom's theory of influence. plus it's always hard to tell who your influences are--there are books you like, but there are also the great books you don't think of but probably learned something from anyway. plus it's not static--you keep reading even as you write, and you're constantly influenced by things you read. his personal influences (when younger) include CS Lewis, Asimov, Fitzhugh, Marcuse, Wodehouse, Karl Kraus, The Dialectic of Enlightenment, DeLillo, Coover, Pynchon. Kafka was a bigger influence, The Trial especially (detailed in section247 and a coming note). DFW liking to be in control and how that played out in his final year. fiction as a way out of loneliness. infinite jest should have been called infinite sadness. he gets a toy puffin and tries to find out about its process of creation (factory in China). meets up with some birders in Shanghai. ruminates on environmental protection and general activism in China. What Makes You So Sure You're Not The Evil One Yourself?